By John R. Audette, M.S. 1. Before you, there was no IANDS. What were you hoping for when you went to that first weekend meeting at the Moody's farm? Tell us about that weekend - Who was there? What was the agenda? What happened? What was your role? How is the organization different now from what you envisioned then? The first organizational meeting took place over a weekend in November 1977 at a Holiday Inn in Charlottesville, VA on Saturday and at the University of Virginia on Sunday, the next day. In attendance were Drs. Beverly Belk, Bruce Greyson, Sarah Kreutziger, Raymond Moody, Donald Mueller, Kenneth Ring, and Michael Sabom, as well as Mr. John Egle (publisher of Life After Life and owner of Mockingbird Books at the time), Gina Weiss, M.S., Sue Palmer, myself (John Audette) and a few other interested persons. A subsequent meeting took place at Dr. Moody's 500-acre farm in Headwaters, VA. The agenda for this initial meeting was to formulate a plan to establish an international organization that would serve the interests and needs of individuals who reported having near-death experiences, as well as peak experiences generally, and the researchers who study them, and also to serve as a resource for the general public seeking credible information on the subject. The outcome of this meeting was the formation of the Association for the Scientific Study of Near-Death Phenomena. As far as I know, it was the first organization of its kind in the world devoted to these specific purposes. Soon after this meeting, in early 1978, I relocated to Peoria, Illinois to teach at Illinois Central College and to work as health planner with the Illinois Central Health Systems Agency. Then, during the summer of 1978, the Association held its first board meeting at Washington University in St. Louis, MO. In attendance were Drs. Greyson, Ring and Sabom, as well as myself. At this meeting, bylaws were drafted, as well as articles of incorporation and the application for tax exempt status with the IRS, which was filed soon after and subsequently approved. As for my role in this endeavor, for three and one half years (1978-1981), I oversaw the activities of the Association as its first Executive Director from my home in Peoria, Illinois. I created its first brochure, developed the initial membership, responded to numerous requests for information and published a quarterly newsletter. I also conceived and named the scholarly journal Anabiosis, which was initially edited by Dr. Ring for the first few issues, and then subsequently by Dr. Greyson. In 1982, I relocated to West Palm Beach, Florida to direct Hospice of Palm Beach County. Due to my weighty responsibilities at hospice, I was no longer able to manage the Association as I had before. Dr. Ring, who was a member of the faculty at the University of Connecticut, Storrs, graciously offered to rise to the occasion. So in late 1981, I passed the baton to Dr. Ring and relocated the Association's operations to the University of Connecticut at Storrs. Shortly thereafter, Dr. Ring conceived a new name for the organization and its legal name was changed to The International Association for Near-Death Studies (IANDS). Under Dr. Ring's leadership, the board of directors was greatly expanded, the membership grew and IANDS generally flourished into the organization that exists today. 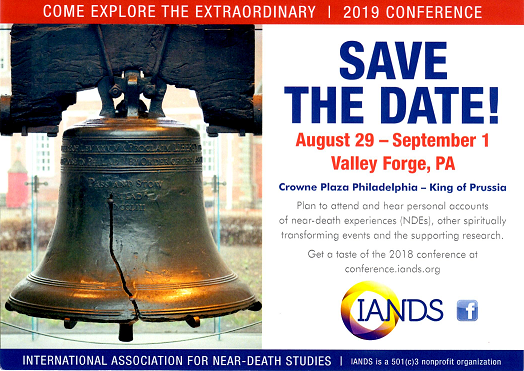 My greatest contribution in the creation of IANDS is that I originally conceived the idea for the association and organized the initial meetings that led to its formation. I also made a list of the researchers working in the field, or interested in doing so, and invited them by mail or telephone calls to join Dr. Moody and me at the first organizational meeting in November 1977 to explore the merits of forming an association of this kind. I convened and conducted the first organizational meeting. So, in this sense, I suppose it is fair to say that the Association was my brainchild. I think most fellow co-founders would agree, if not all. Although I originally conceived the association and served as the principal catalyst for its formation, it took shape through a process of collaboration and teamwork that spanned several months in late 1977 and early 1978. Thus the formal organization known today as IANDS was indeed co-founded and co-created by Drs. Greyson, Moody, Ring and Sabom and myself. The history behind the evolution of the idea I conceived to create an association of this kind began in the spring of 1975. Back then, I introduced Dr. Raymond Moody, then a medical student at the Medical College of Georgia in Augusta, GA, to Dr. Elisabeth Kübler-Ross. This introduction took place at a community college in Georgia, near Atlanta, either Marietta or Kennesaw, where Dr. Kübler-Ross was speaking. I considered this meeting to be historic. Dr. Kübler-Ross, at the time, had achieved great public recognition for her book On Death & Dying and for her efforts to spearhead the hospice movement in the U.S. and abroad. I had befriended her the year before and attended many of her workshops and lectures. She and Dr. Moody had much in common, including their mutual interest in near-death experiences. The two had exchanged correspondence prior to their meeting and had been in touch over the telephone, but I felt it was important for them to meet personally, and so I arranged for them to meet after her lecture that day. Following this meeting, which occurred just prior to the publication of Life After Life. Dr. Kübler-Ross agreed to write the Foreword to Life After Life. In this Foreword, she congratulated Dr. Moody for having the courage to put his findings into print. She also commented that his work, and the near-death experience generally, are "proof of life after death". Dr. Moody himself never made this claim, but Dr. Kübler-Ross never had any doubt about it, nor any qualms about it. I loved her for that, among many other things. Indeed, it was her courage in the face of intense criticism from fellow medical doctors and clergy that spawned the whole death and dying revolution in America and elsewhere. She was one great and brave lady. At her public lectures, Dr. Kübler-Ross often spoke about her encounters with people who reported near-death experiences to her. She said she had collected thousands of cases over many years of working with dying patients and in clinical encounters as a practicing psychiatrist. She spoke openly about her conviction that near-death experiences were powerful and could dramatically change socio-cultural perceptions of what it means to die and what happens afterwards. She often opined that current views about death and life after death were erroneous and could be profoundly reshaped based on findings from research into near-death experiences and related phenomena. The insights offered by Dr. Kübler-Ross were inspiring to me. Her views resonated with me down to the deepest core of my being. Her words had an undeniable ring of truth and they motivated me to explore the potential for social change that exists within the near-death experience and related phenomena. I would often speak privately with her and Dr. Moody about this general interest of mine. As a sociologist by academic training, I could not think in any other terms but social change. The world was crying out for it, and it still is. From the outset of my involvement in this field, dating back to early 1974 when I first met Dr. Moody, I have always been and continue to be focused solely on the potential for socio-cultural change that lies within the NDE and related phenomena. I have often opined that within this body of knowledge lies great potential to bring about sweeping and profound socio-cultural change, and this is what interests me most about NDEs. Dr. Kübler-Ross shared this sentiment as well. Soon after the publication of Life After Life, circa Fall 1975, Dr. Moody and I both relocated from Georgia to Virginia. Dr. Moody went to the University of Virginia in Charlottesville to complete his residency in psychiatry. I went to Virginia Tech in Blacksburg to earn a Master of Science degree in sociology. During this time, I helped facilitate the exchange of information between Dr. Moody and other scientists concerning their independent research efforts into NDEs. With the publication of Life After Life, Dr. Moody became an overnight celebrity. There was a virtual explosion of public interest in the subject. Then in 1976, while Life After Life continued its reign on the best seller list, Dr. Moody published his second book, Reflections On Life After Life. He began to appear on numerous talk shows and also granted a number of media interviews. He also fielded a deluge of requests for personal appearances and speaking engagements. Letters and phone calls flooded the Moody residence from all over the world. I helped Dr. Moody manage what had become a truly overwhelming mountain of interest, including inquiries from other researchers who contacted him to ask questions and seek assistance in designing research efforts of their own. Also, near-death experiencers began to write in search of more information. Moreover, members of the clergy and the interested public began to contact Dr. Moody as well with questions, invitations to speak and so on. Sensing the critical need and the opportunity to further my interest in applying findings from NDE research toward the lofty goal of advancing positive social change and transformation at the individual and collective level, I suggested to Dr. Moody that we should form an international association that would bring together researchers, experiencers and the general public in further pursuit of their common interest in NDEs. This occurred in late 1976 or early 1977 as I recall. Dr. Moody agreed that the idea had merit, and shortly after, the researchers known to Dr. Moody at the time were contacted and invited to the November 1977 meeting in Charlottesville to discuss the formation of an association that would further the scientific study of NDEs and that would also serve as a support group of sorts for experiencers, as well as a clearinghouse of information for the public at large. 1. We are all one. There is no duality. There is only universal oneness. Egocentrism is a problem of misperceiving true reality. Take away duality and with it would go greed, self-interest, violence, fear, competition and many other current conditions which do not serve the greater good or our collective best interests as a species. 2. There is survival of consciousness beyond death. Death is not the end of existence. We are eternal beings. 3. The purpose of life is to love each other and care for each other unconditionally and non-judgmentally, to grow intellectually, to cooperate and collaborate, to be happy...to celebrate life...have fun...enjoy! 4. There is a Supreme Being or Source or Creator who is all-knowing and non-judgmental and who is the perfect manifestation of pure unconditional love. 5. There is no reason to fear death for it is only a doorway to another level of existence which is beautiful and blissful beyond words. We all come from the same Source and we all return to the same Source. We are all one, truly, as NDEs teach us, which gives new credence to the Golden Rule. 6. We are responsible for what we say, what we think and what we do. In the presence of absolute love and knowledge, we will judge ourselves one day. We will learn that what we do to others, we do to ourselves, for we are all one. We will atone for whatever we do that is unloving and unkind. We will have no choice but to continue to repeat the birth/re-birth process until we learn to be pure vessels of unconditional love, caring and kindness. 7. The NDE teaches us many things, but clearly it teaches that we should live our lives not for the things of ego or the material world, but for the marvelous journey that begins when we leave the body, hence the need for every thinking person to reevaluate values and priorities while on earth. All we take with us is our record of deeds. I have long felt that NDEs and related phenomena present a novel opportunity to link science and religion. When the message of NDEs is fully understood and comprehended by humanity, there is great potential to realize our most grandiose aspirations for "higher civilization" and for massive transformation in the nature of political, economic and social systems on a global level. I am thrilled IANDS continues some 34 years after its founding. I hope one day it will evolve into the force for positive global change that I always thought and intuited it could be. God knows, the world would be better for it. 2. What puzzles you most about NDEs? What do you find most interesting in the field of NDE studies? How have your family and friends reacted to your interest in this field? How have you integrated what you have learned from NDEs into your religious views, your scientific views, your view of reality? What puzzles me most about NDEs is why only a small percentage of people who lose consciousness during a close brush with death report an NDE. I am puzzled as to why some have NDEs and others do not, or at least do not remember having one. What interests me most about NDEs is the transformative effects reported by those who undergo such experiences and the significance of this by extension for the rest of humanity, who would do well to heed the central messages and insights derived from NDEs and related phenomena. Imagine how individual perceptions and values would change as a result. Imagine how the world would change. No more hunger, war, poverty, etc., for starters. Heaven on earth. Paradise and bliss realized. My family and friends support my interest in this field, generally, and have mostly benefited from the knowledge I have shared with them about it. My work in this area enabled me to direct two hospice programs, and to offer comfort and support generally to family, friends and others who are facing their own transition. When I began my involvement in this field in 1974, I was agnostic. I had no opinion about the existence of a Creator or survival of consciousness after physical death. I had been raised Catholic, but abandoned that religion and others I tried out subsequently sometime in my early twenties. My views then changed to what is described above after interviewing many experiencers and conducting my own prospective study at two medical centers in Peoria, Illinois, and examining the findings of other researchers, including those of Dr. Elisabeth Kübler-Ross. All of this work has culminated in co-founding Quantrek, Inc. (quantrek.org) with Dr. Edgar Mitchell, the Apollo 14 astronaut who was the sixth man to walk on the moon in January 1971 and who also founded the Institute of Noetic Sciences (noetic.org). For me, Quantrek represents an intellectual marriage of quantum physics and my long standing interest in peak or transpersonal experiences. I now subscribe to the quantum hologram model of reality, which like the NDE, has powerful and far-reaching implications for civilizational advancement and conscious evolution of our species. 3. Thinking about your deepest hopes for IANDS - what turned out better than you'd hoped? What surprised you? What disappointed you? What might you have done differently? What would you like to see happen/ explored in the future? What turned out better than I hoped is that IANDS still exists some 34 years later as of this writing in May 2011. Bravo! What has surprised me is that it has consistently found ways to overcome many challenges and struggles to endure and remain viable. What disappoints me is that it remains chronically under-funded and was never able to fully implement its mission in the areas of education and research, as well as initiatives to apply research findings in practical ways. My original strategy in this regard was to secure commitments from all of the researchers to donate not less than 10% of their total annual income to IANDS to give it an initial base of support and adequate working capital. This seemed to be a feasible strategy in the beginning, but lost its head of steam when severe financial adversity befell both Drs. Moody and Kübler-Ross due to unscrupulous business managers. As noted earlier, my bias all along in this work has been to promote the advancement of human civilization using NDE research findings as a platform, vehicle or catalyst. Few in IANDS shared my passion in this regard, at least to the same degree anyway. Dr. Chuck Flynn was a strong kindred spirit in this regard, but he was one of a few who passionately embraced this aspect of NDE research. I confess that I am intolerant of things like war, hunger, poverty, illiteracy and the like, and have been perhaps over-zealous in my passion to harness the power of NDE research findings to help humanity evolve into a better way of relating to one another and the planet. I never much cared about how this work could benefit my popularity, career, publishing prospects, media profile or personal net worth. These things were of no interest to me and were not considerations for me, then or now. But many others in the field were motivated by self-serving things of this sort which compromised the purity of this work in my opinion. I suspect its overall integrity suffered as a result. It was this disconnect or incongruity between the compelling message of the NDE contrasted with the self-serving conduct of some in the field, both researchers and experiencers alike, that caused me to withdraw from IANDS and the field of study generally circa 1986 as I recall. I simply could not abide the inconsistency and the conflicting agendas. My focus was to work as selflessly and altruistically as possible to attempt to change the world and dramatically improve the human condition by packaging the magnificent insights gained from NDEs as to who we really are and why we're really here. Others simply sought to further their own personal interests, researchers and experiencers alike, and this incongruity troubled me. If I could change anything, it would be to change myself in ways to make myself a more effective leader at the beginning of IANDS. If I knew then what I know now, perhaps things would be different today with IANDS in terms of its funding, its capabilities, the caliber and reach of its contributions and its future prospects. What I would like to see explored in the future is a re-birth of the core idealism and activism that inspired me to conceive IANDS in the beginning. The world is a very troubled place. It need not be. The message of the NDE could do much to move humanity from where it is to where it could be while there's still time. Admittedly, much more rigorous research is needed to firmly establish NDEs in a credible way to the point where findings might reshape perceptions, values and opinions. But funding for that research remains as elusive as ever. A few years ago, a glimmer of hope surface in this regard through the prospect of funding from the Fetzer Foundation, but this never materialized as I hoped it would. I remain hopeful, however, that someday adequate funds will materialize to fully operationalize and implement that original vision I held for IANDS. Until that day, it is a matter of keeping the faith I suppose. IANDS has done a great deal of good over the past 34 years, and I am very proud of that. It has made many wonderful contributions to be sure. But I am one who cannot help himself when it comes to the overwhelming desire I have to help engender a much more perfect world, Nirvana in fact. IANDS for me was a way in which that dream could be brought to life. It did not manifest on the level I had originally envisioned, but nevertheless, many good things have come from the seeds that were planted way back in 1977. I remain hopeful that the future will bring IANDS to new and greater heights of achievement in keeping with the original vision I held for it some 34 years ago. John R. Audette, MS, is a co-founder with Dr. Edgar Mitchell and currently serves as President & CEO of Quantrek, which is dedicated to public education and scientific research focused on the science of consciousness and cutting edge quantum physics.